This article examines a recent judgment by the European Court of Human Rights (E.B. v France) that upheld the complaint of a homosexual woman who alleged that her application for authorization to adopt a child had been refused by domestic French authorities on the grounds of her sexual orientation. I argue that the judgment constitutes an innovative and atypical legal consideration of, and challenge to, the heteronormative social relations of contemporary European societies. After exploring the evidence presented by the applicant, and the Court’s interpretation of it, I argue that in order to reach its judgment it was necessary for the Court to make a significant departure from its established jurisprudence in relation to sexual orientation. An essential element of this involved the adoption of a distinctive critical approach, strongly resonant with aspects of ‘queer theory’, which focused attention on the social, cultural and political construction of normative heterosexuality. 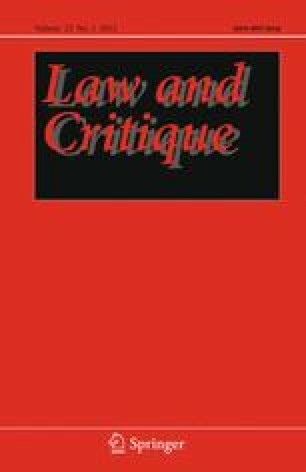 Whilst a number of commentators have assessed the importance of the judgment in terms of its evolution of ‘gay rights’ in the area of family life, I argue that the Court’s reconceptualized ‘theoretical’ understanding of, and critical approach to, heteronormativity offers the potential to expand the scope of the European Convention on Human Rights across a number of areas of social life—in marriage, public assembly, freedom of expression, as well as family life—where non-heterosexuals continue to face discrimination in contemporary Europe. Human Rights Watch Europe. 2008. ‘Gay adoption ruling advances family equality’. http://www.hrw.org/en/news/2008/01/23/europe-gay-adoption-ruling-advances-family-equality.